About: Soundwalk Into Wellbeing is a live immersive sensory experience, guided by wellbeing practitioners, sound artists, and seldom heard carers, using innovative sound technology to address challenges of isolation, stress, disability and poor health. Taking place in local parks, canal sides, gardens and unexpected local havens for nature, the soundwalks are designed to lift energies, through cultivating a sense of curiosity, as seldom heard carers, loved ones and friends, tune into the sound, movement and touch of nature, through the healing power of the breath. Central to the recent Beeston Lock sound score transmitted via radio headphones, we hear stories of wellbeing and resilience collected from seldom heard carers and canalside people who have drawn on challenging lived experience to let nature, breathe space into their daily lives. Embedded into all the Soundwalks are The 5 Ways To Wellbeing, Connect, Keep Learning, Be Active, Take Notice, and Give, so all are welcome to stay on after the soundwalks for a friendly gathering, to reflect on shared wellbeing experiences and build peer support. Partners and Funders: Soundwalk Into Wellbeing at Beeston Lock has been developed by Salamanda Tandem, in partnership with Better Carers and Co-Production Team Nottinghamshire County Council, Canalside Heritage Centre Beeston Lock, the Carers’ Council and Beeston Carers. Celebrating: Mental Health Awareness Weeks: www.mhaw.org.uk and World Mental Health Day. Look out for our next Soundwalk Project in 2019 at Cresswell Crags! Normally for dance workshops, and performances the long cane is folded up, but Isabel’s idea was to make the long cane itself central to the work. Thus, Isabel wrote up the concept of ‘White Cane’ as a submission to Corby Cube, which embedded the idea of a visually impaired friend; performer Mickel Smithen (pictured above), leading an audience independently through a busy city centre street. Corby Cube weren’t interested, but the innovative Ludus Festival Leeds and Professor Mick Wallis were. Thus, WHITE CANE Salamanda Tandem was born, and was premiered in Leeds for Ludus Festival in June 2014, after a 6 month process of audience and artistic development. 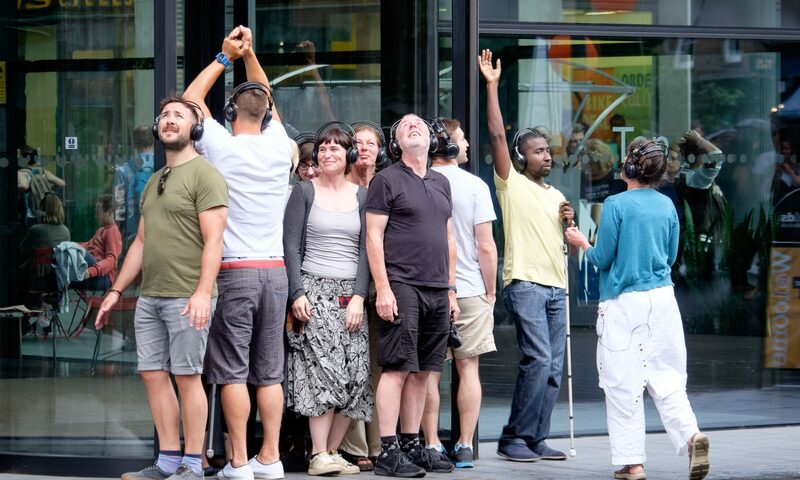 Programme note: “Audiences wearing wireless headphones are immersed in a sound world created by visually impaired performers exploring and navigating public space. As the long cane rolls across the surface of each space, we hear it’s sound, which is combined with live viola, and spoken and sung audio description to create a unique experience of ‘sonic vision’. and a short fragment of the soundworld here…..
Salamanda Tandem White Cane Information for Promoters Dec 2017 screen view In 2015, after the success of the premiere, Isabel and Duncan Chapman applied to Sound and Music to work together as co-curators of a national tour of White Cane and were Recipients of the national White Cane Composer Curator Award . Thus a series of unique site-specific performances with national partners were developed, which helped attract further funding from the national lottery Grants for The arts through Arts Council England toured nationally in 2016, 2017, and 2018. New Building and studio built in 2016 – 2017. Now open! 30 years Publication coming soon!